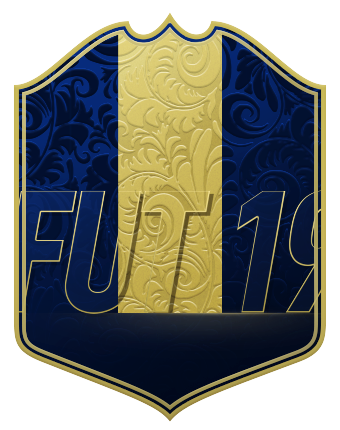 Roman Burki - GK - OVR 81 We start the prediction with a keeper which I am shocked is yet to receive an IF, with numerous good performances previous to this one. Although Dortmund didn't manage to keep a clean sheet during their 2-1 win over Mainz although with eight saves which included a magnificent treble save he was awarded a perfect 1 match rating by Kicker, which saw him go on to pick up player of the week. Kalidou Koulibaly - CB - OVR 88 Annoyingly Koulibaly was awarded an average match rating of 7 but with two goals to his name in Napoli's 3-1 win, I can't see him being left out of TOTW 31. As for his rating, I am expecting a 92-rated item with the FUT Birthday item taking no toll on the IF chain. Mathieu Debuchy - RB - OVR 78 Strangely Debuchy failed to feature in L'Equipe's TOTW, despite claiming an 8/10. The match rating is likely to be what EA will go off though and with two goals in a 3-0 win, I find it extremely unlikely that Debuchy will be snubbed come Wednesday. Nico Schultz - LWB - OVR 81 The only defender I am not confident on this week is Schultz which usually sets up for a decent score. I expect the same this week and Schultz is a strong candidate too after claiming MOTM for his assist in Hoffenheim's 2-0 win. Kingsley Coman - LM - OVR 83 With a lot of the Bundesliga matches being low scoring affairs it resulted in very few options for this weeks side. One player that did manage multiple attacking contributions, however, was Coman, The French winger scored two of Munich's four goals as they picked up another three points with a 4-1 win over Dusseldorf. Kevin De Bruyne - CM - OVR 91 Many will probably be expecting Sterling to feature after yet another brace for the winger but with the amount of IFs he already has I can see EA using this as an excuse to instead opt for KDB, who assisted twice in the same match. Sterling was MOTM but I have to punt KDB on this occasion. Ryan Fraser - LM - OVR 77 This was the final position I had to fill and I seriously struggled in doing so. In the end, I opted for Fraser's goal and assist simply due to the fact Bournemouth managed a 5-0 win, which in the Prem should stand out. Nicolas Pepe - RM - OVR 79 The performances just keep coming from Lille's Nicolas Pepe, of whom I fully expect to be signed up in the summer. The 23-year-old was crucial once again as Lille recorded probably the best result of the week, destroying league leaders, PSG 5-1. Pepe scored once and assisted another two, claiming MOTM for doing so but if EA wants to look elsewhere I expect Fonte to be the route they go. Lucas - ST - OVR 82 With Kane out of action again due to injury it has given Lucas another run in the side and with the performances he is showing you could argue that he deserves to stay there. 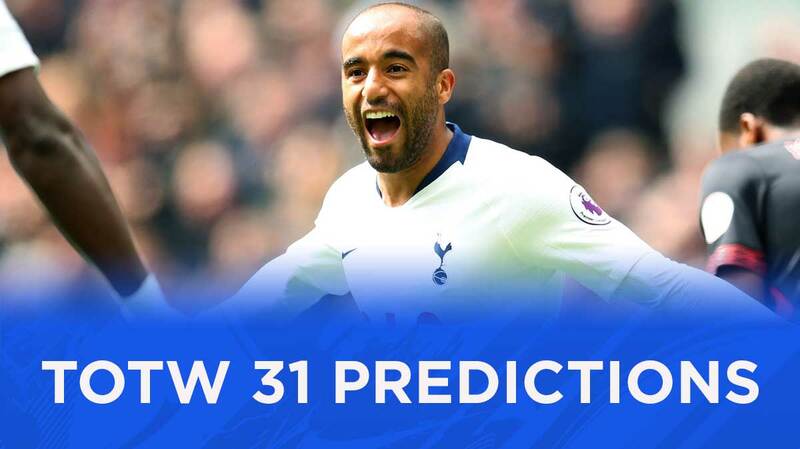 The Brazilian managed to score a superb hat trick for Spurs during a 4-0 win over relegated Huddersfield, adding to his goal the week before. Inaki Williams - ST - OVR 81 From one fast striker to another, this time with Williams after he scored a vital brace in a narrow 3-2 win over Vallecano for Bilbao. He was snubbed a couple of times previously for a brace but with a lack of Spanish division options he stands out for selection. Rogelio Funes Mori - ST - OVR 77 The fact that this match was played so late could harm Funes Mori's chances but with a late Monday addition to the side last week, surely EA have to implement some consistency? Mori scored three goals in Monterrey's 4-0 win, in a result that sees them go third. Alessio Cragno - GK - OVR 75 I almost once again went with an Oblak punt but after noticing that Cragno was Gazzetta's player of the week, both keepers became easy to predict. Cragno got the accolade after making a total of seven saves in a 1-1 draw with Torino, from which Cagliari ended with nine men. Nathan Redmond - LW - OVR 75 With Southampton finding themselves in a relegation battle three points over an impressive Wolves side is something that could end up to be crucial in a few weeks. Redmond spearheaded the 3-1 win scoring two of those goals. Rafa - LM - OVR 79 There's only really one option from Portugal this week and it's a strong one with Rafa playing a part in three Benfica goals, with a brace and an assist during Benfica's 4-2 win over Setubal. A result which keeps them on top via goal difference. Dwight Gayle - ST - OVR 75 One of two hat tricks from the Championship that I have included this week in Gayle. 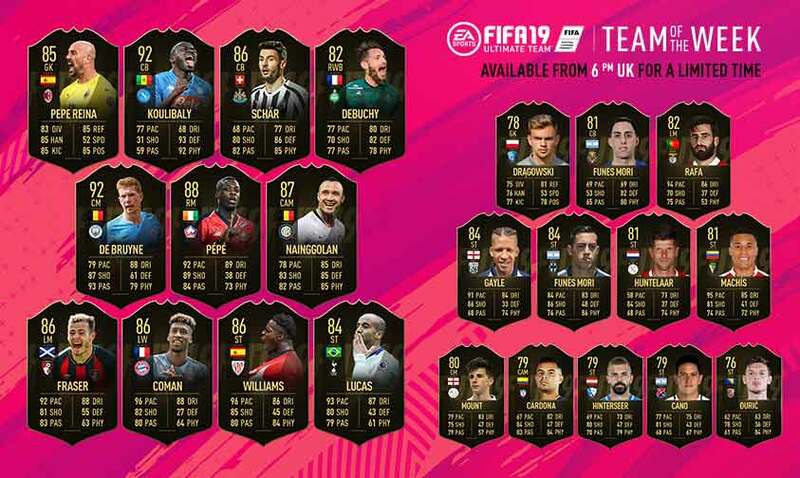 With Gayle being a gold item in FUT I can see both being included and after a 5 upgrade to the pace on his first IF, Gayle's second, which will be a ST item looks very usable indeed. Darwin Machis - ST - OVR 75 It's been a disappointing season for Las Palmas, who were doing well in La Liga just a couple of seasons ago but they now find themselves mid-table in the second tier. Cadiz handed another blow their way with a 3-0 win. Machis scored all three of those goals and walks into TOTW as a result. Klaas-Jan Huntelaar - ST - OVR 77 As per usual we saw some high scores in the Dutch division, with Ajax winning 6-2 at home to Excelsior. Huntelaar looks to be the clear favourite for the IF after scoring three of those goals and picking up POTW with an 8/10. Tadic, who scored twice and assisted another misses out narrowly once again. German Cano - ST - OVR 72 With multiple hat tricks being scored this week if I was to bet which one would be ignored it would be Cano, but actually ignoring a hat trick is a lot harder than it sounds and thus I have ended up including him. The Argentine scored three in his sides 4-0 win. Mason Mount - CM - OVR 74 Derby continues their late push for a playoff spot with a convincing 4-0 win at home to Bolton, who are now just one loss off relegation. Mount scored three of those four goals from CM, making him nailed on for a TOTW spot. Lukas Hinterseer - ST - OVR 73 The player of the week in the second division of Germany went the way of Hinterseer after he scored a hat trick for Bochum in a 3-2 win in their mid-table battle with Furth. Leonardo Ulloa - ST - OVR 73 It's not often that you see a game with 12 goals being scored within. Nine of those twelve went the way of Pachuca, which as you can imagine resulted in numerous IF options. There were a couple which narrowly missed the cut but it is Ulloa who gets the nod from me, scoring three and assisting another. Milan Duric - ST - OVR 68 With a lack of options in the Serie A, the fact a Serie B hat trick occurred is very handy as far as predictions go. Duric scored three of four Salernitana goals in their 4-2 home win over Cittadella.